The veil of secrecy over Avengers: Infinity War is rising, and now the final designs of The Children of Thanos, formerly the black Order have been revealed. The group have proven inseparable from Thanos the Mad Titan in Marvel's comic universe, so it's only right that after the Infinity War design for Thanos was finally unveiled by Disney as part of their D23 festivities, his villainous 'children' should come next. Aside from the designs, the reveal confirms once and for all that the Avengers will be facing more than just Thanos when the Infinity War begins. Fans of the Marvel Cinematic Universe can say hello to Cull Obsidian, Proxima Midnight, Corvus Glaive, and Ebony Maw. They're characters that comic readers have known for some time, introduced in recent years by Jonathan Hickman in his Thanos-focused Infinity series. We don't know exactly how much the movie versions of the Black Order will stray - or which one of them Spider-Man may show up to fight - but fans should know the dangers and weakness of each. The Avengers have to do the same homework, after all. Considering that these generals and loyal warriors have been modified to be called Children of Thanos in Infinity War, fans should waste no time in getting to know the 'family' of the Infinity-Gauntlet-seeking supervillain pulling the strings. 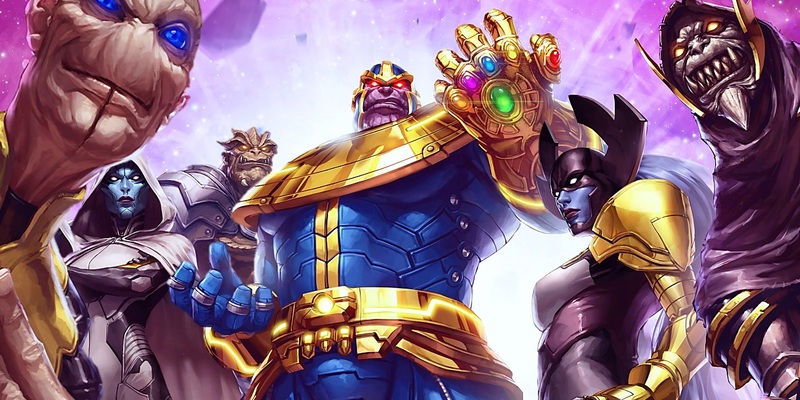 If Thanos were handling his coming war with the Avengers in terms familiar to players of squad-based role playing games, then he would most definitely need a Tank - a warrior strong enough, fearless enough, and brutal enough to be his heavy hitter. And when Thanos is considering you a heavy hitter, that's truly saying something. The task of being Thanos's most brutal warrior will likely fall to 'Cull Obsidian' - the name of the entire group in the comics, now used as a replacement name for Black Dwarf. The name was based on the last stage of stellar evolution, but it seems Marvel Studios may not like the social connotations? The appeal of a differently-colored, horned, evil Hulk may not be all that shocking, but fans will want to pay special attention to the member of Thanos's Black Order who may be the easiest to classify and dismiss (bruiser, got it, move on). We knew ahead of time that Apes veteran Terry Notary was playing Black Dwarf, after teasing that he was playing 'one of four' henchmen for Thanos. He called himself the Mad Titan's true right-hand man at the time, so Cull fits the bill (even with a weapon swap from axe to swords). Hopefully he'll fare better on film than he did in Infinity, being stopped and driven back by Black Panther when he tried to conquer Wakanda. He wound up killed by Ronan the Accuser, but considering Ronan died back in Guardians of the Galaxy, some changes should be expected. Since there are more than four members of the Black Order in the Marvel Comics version of the Thanos-led team, not every one being adapted to the Infinity War on film could be as easily confirmed. But thanks to some set photos and videos of Proxima Midnight's staff, her inclusion was all but guaranteed long before this official reveal. It's both a blessing and a curse, then, that the movie version of Proxima's famous staff looks almost identical to that of the comics. With Proxima's fighting skills, leadership, intelligence, agility, and endurance rivaling, if not beating her fellow soldiers, it's easy to call her the most formidable of the Black Order warriors. And that's not even including the unique nature of her aforementioned staff. Built to harness the power of a sun in a distortion of the normal universe, it's been shown capable of possessing the weight of a collapsing star, the power of a supernova, and the pull of a black hole. That means the staff is lethal to almost any superhero whether it's thrown, used to launch attacks, or even placed on top of the Incredible Hulk, for instance.